Arnold Schwarzenegger hints he’s not done with the Terminator franchise yet. Sigourney Weaver talks Avatar 2. Marc Guggenheim teases mortal danger in Legends of Tomorrow, and why Oliver and Felicity broke up in Arrow. Plus, a new look at Agents of SHIELD’s return, and more details on Bruce Timm’s next DC movie. Spoilers! Making Star Wars has a new report about some new costume changes in the movie. Firstly, there’s two “Executioner” Stormtroopers that will be seen with Captain Phasma in several scenes, who carry some kind of electro-pike sort of weapon—otherwise, they look like normal First Order Stormtroopers, except with black shoulder pads and a black strip running from their helmet’s right eye lens over to the back of the helmet. Meanwhile there’s also new talk of a slight visual update for Kylo Ren. It’s minor, but potentially revealing: he’s replaced his tattered half-cape from The Force Awakens with a full cape in the style of his grandfather, Darth Vader. There’s even potentially talk that it is actually Vader’s own cape itself, which would make sense for a man like Kylo Ren, who desperately wants to become Vader 2.0 (how the hell did he get it off that burning pyre on Endor intact if it is, though?). 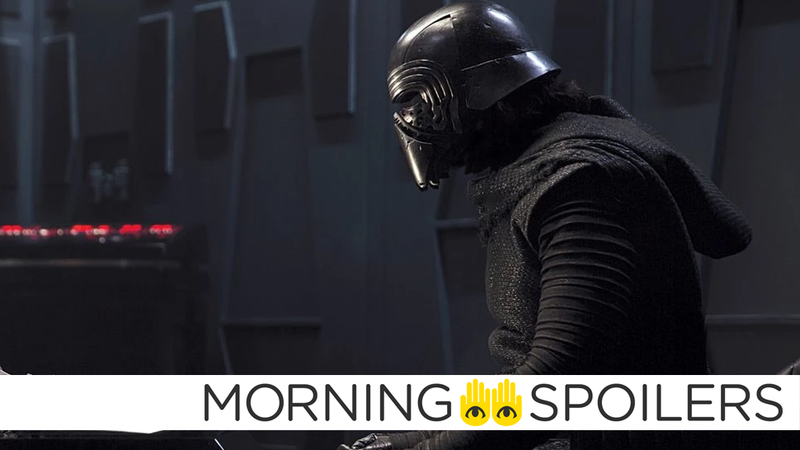 Interestingly, Kylo’s helmet will also get a slight update in the film—not a major change, but it’ll instead look much cleaner than the damage-marked one seen in TFA. What won’t be clean is Kylo’s actual face when he’s not wearing the helmet: a gruesome looking scar across his nose and down over his right cheek from his duel with Rey will give him a physical reminder of his past tustle with the new Jedi apprentice. Head on over to the link above to see some “accurate fan art” of the new designs. I don’t want to call it, like, fake news, like the president calls it, but I think people just write things – I have no idea why. Just because Paramount doesn’t want to pick up the Terminator franchise, you have 15 other studios willing to do it – that doesn’t mean the Terminator franchise is finished, right? It just means they are on their way to negotiate with another studio, but I can’t give you the details of that. They’ll announce that. But, yes, the Terminator franchise is never finished. And remember that after 2018, James Cameron is getting it back, and then it will continue on! According to Sigourney Weaver, the sequel is finally shooting this fall. We’re starting! We’re starting training, and we’re starting — hm, I probably can’t say anything. We will be actually shooting it by the fall. I’m telling you, these scripts are so amazing. I’m not worried about [disappointing fans] at all. Am I worried about how we’re going to bring them to life? Yes, because they’re so ambitious. They’re so worth it. They’re well worth waiting for. I’m not worried about that at all. We’re trying to get it done as quickly as possible. The latest direct-to-video animated Batman film will be a TAS reunion— at least, to a point. Kevin Conroy is, of course, voicing Batman, but now we know Loren Lester will be reprising his role as Nightwing. Harley Quinn has been recast with Michelle Rauch, Paget Brewster will voice Poison Ivy, and perhaps most surprisingly, John DiMaggio is voicing Swamp Thing. Producer Eric Carrol revealed The Shocker pillaged his gauntlets from whatever was left of Crossbones following the events of Civil War. That gauntlet, you’ll recognize from the beginning of Civil War, it’s what Crossbones is using to kick the sh*t of Cap in that prologue. They scavenged it from the battle in Lagos and made a couple of upgrades, so that it’s not a pneumatic punch machine, it also delivers a pretty hefty jolt when it connects as well..
Michael Keaton also elaborated on The Vulture’s relationship with Shocker and The Tinkerer in an interview with Coming Soon. They are just his boys, you know? I really like the relationship with the Tinkerer–with Michael (Chernus)’s character–it’s great. He’s real funny, so we goof around a lot and make up very, very funny backstories. They’re funny, but then you think, ‘Well, that’s probably their relationship. They probably get on each other’s nerves sometimes.’ I have a lot of the ideas and then I just say, “Go make that. Go make that for me. I want to have a thing that does all this stuff. Just go make that stuff for me.” And he’s great. I’m having a lot of fun in that relationship. Meanwhile, if you were wondering about Uncle Ben, producer Eric Carroll revealed he’s “discussed”. They talk about that, absolutely. It’s not… it’s not a huge thing that I want to go into too much, but there is an acknowledgment that there was a Ben. Jon Watts elaborated, “we’re implying he’s dead”. I mean, we’re implying he’s dead. We have not at all, again, gone into trying to change his origin story as far as I have been envisioning it. But we, just again, we thought that to keep this fun, light tone, as soon as they have to have their, like, ‘Let’s remember our dearly departed father figure’ – it derails that a little. And again, what we’re trying to tell is this sort of fun story of the kid who is doing all the wrong things for the right reasons. And once you do that, it stops becoming a sort of sun movie about a kid trying to be a kid. He’s mourning the loss of a parent. A minute-long trailer posted to the film’s Twitter has some new footage. Star-Lord lists everybody who wants to kill him in the latest TV spot. Surprisingly short list for a man like Star-Lord. According to Sonequa Martin-Green, the new Star Trek series will be “rawer and grittier” than we’re used to. This iteration of Star Trek is going to have a different take than the others in the Star Trek canon. It’s going to be bigger, rawer and grittier… and the story’s going to build on itself. It’s going to be a tremendous journey. We definitely get a definitive end to the Legion of Doom/Spear of Destiny story. The end is a cliffhanger in the vein of Season 1… It’s an equally shocking finale as last year’s. But whereas the Season 1 [finale] was introducing a character or a group of characters from the JSA, [this ender ushers in] a concept. Episode 20, “Underneath”, will finally reveal why Oliver and Felicity ended their engagement, according to executive producer Marc Guggenheim. One of the things that we’ve always wanted to do, and I think a lot of the fans have asked for, is basically deal with the consequences of Episode 415 [when] Oliver and Felicity ended their engagement and broke up. They never really had a full-on discussion or exploration of why that breakup happened. Felicity just sort of reached her breaking point and walked out the door” — that is, after the tech that remedied her gunshot-induced paralysis kicked in, allowing her to rise from her wheelchair to her feet. This is definitely an examination of the state of their breakup. It comes out of the events of 519 [titled ‘Dangerous Liaisons’ aka ‘Team Arrow vs. Team Felicity’] and, quite frankly, all the other episodes that led up to it. Something happens in 519 [airing Wednesday, April 26] that really tees up this conversation. Daisy finds herself in Hydra HQ and face to face with Melinda May, Agent of Hydra, in a new clip. Unlike other seasons of iZombie where there was a pretty clearly defined big bad — we kind of let our bad guys let it rip. Like full-on, mustache-twirly, go for broke. Steven Webber and David Anders got to be full-throttle bad guys — this year is different. Those seasons ended in big shootouts. That’s not our plan this year. This year it’s Liv trying to figure out where she exists in a zombie vs. human world. Meanwhile, Buddy TV sat down for a chat with Rahul Kohli. Finally, Buddy TV has pics from this Thursday’s episode, “The British Invasion”. See more at the link.